Health organizations worried Sierra Leone's mandatory quarantine could drive panicked communities into further isolation, and Médecins sans Frontières expressed concerns about where new cases would be treated. But almost two weeks later, a place imagined to be the one of the worst equipped to deal with an outbreak of Ebola is taking serious precautions other than staying at home. Kroo Bay, a sprawling slum in the capital, Freetown, conducted a two-day door-to-door campaign to identify any potential Ebola cases that have been hidden among an estimated beachfront township of 15,000 people. According to Awareness Times, the community came together on the decision to find out the severity of the outbreak in their area following the death of a local herbalist, Santigi Bangura, also known as Agba Kuduku. Ibrahim Sidi Sesay, the zonal community chairman, said an emergency meeting was held and people agreed to conduct a sensitization drive and refer sick people to the Lakka Holding Center. Holding centers are where suspected Ebola cases are brought by surveillance teams. The patient will be asked questions and given a blood test. The patient will then stay in the isolation center for 24 hours while the blood is being tested and when there is a result, they will either be discharged or taken to the hospital. Sesay also told Awareness Times that the face-to-face visits had been conducted with the support of the National Anti-Violence Movement. They also hoped to continue weekly calls with the help of the police and medical personnel to educate families on the disease and especially, how it can be spread. The paper also reported that the herbalist treated a patient who reportedly died after he was brought to the traditional healer. A few days later the healer also fell ill. Abdulai Kamara, a Kroo Bay resident, told the paper he was unhappy over the spate of negative press reports about Kroo Bay. Kamara said he thought people should co-operate with the measures put in place to stem the spread of the disease. Ebola isn’t as contagious as common viruses like colds, influenza, or measles. It moves by contact with the skin or bodily fluids of an infected person. Those who care for a sick person or bury someone who has died from the disease often get it. Bernard Conteh, director of Anti-Violence Movement Sierra Leone, said Kroo Bay posed a threat for the further spread of the virus in the city and called on the government, security agencies and medical practitioners to come to their aid. Earlier in August, AFP’s Frankie Taggart observed that none of the measures seen in other parts of Freetown – the ubiquitous buckets of chlorine, the latex gloves – can be seen in the city's largest slum, and that it was hard to imagine a place more ill-equipped to deal with an outbreak of Ebola. [T]here is no evidence that the people of Kroo Bay are taking any serious precautions other than staying at home, he added. "This is a slum area. We have many gutters, and bacteria and germs. We have many problems in this community, even without Ebola," says father-of-six Hassan Sesay, 38, a lifelong resident. Freetown, an overcrowded city of 1.2 million people, has so far avoided catastrophe, with most of Sierra Leone's 783 cases cropping up in the remote forests of the east. Many of Kroo Bay's inhabitants confess that they now spend much of their free time hiding in their densely packed zinc and wood shanties. While poverty has been their most pressing concern since the end of a ruinous 1991-2002 civil war, now they say they worry about infection. "Everyone is feeling bad when they see what Ebola can do," says mother-of-two Moussu Diallo, 20. "I have never seen anyone with the virus but I worry for my children." Kroo Bay is home to artisanal fishermen, cobblers, tin smelters who make pots and pans from the dented metal of abandoned cars, bakers and carpenters. Pigs poke around in the mud which passes for paving between the huts while women bathe in the open and children wash clothes in the torrential rain. There is no electricity or running water, one health clinic and only four toilets. Infectious diseases have a history of spreading like wildfire through the former fishing settlement, named after migrants from the Kru tribe in neighboring Liberia who settled in the 1960s. 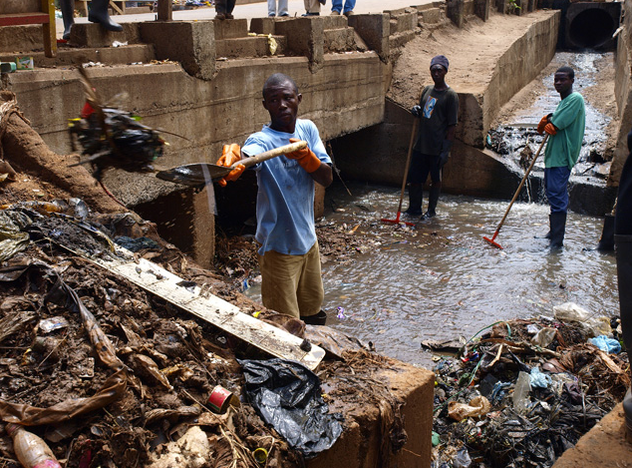 Freetown's more affluent residents dump their rubbish on the banks of the Crocodile River which flows past Kroo Town and mountains of plastic get washed up in the slum. An outbreak of cholera across the capital's poorest housing areas two years ago killed almost 400 people. It rains six months of the year in Freetown, one of the world's wettest cities, and Kroo Bay lies at the bottom of the steep hill on which it was built. Putrid water inundates the slum every summer and brings rats, malaria, cholera, dysentery and respiratory infections. Life expectancy, at 35, is around 10 years below the nationwide average. But for all the hardships of daily life, Kroo Bay has remained a vibrant, bustling, noisy place -- until Ebola. Economics student Mohamed Kamara, the son of Kroo Bay's village chief, says that while he and his friends used to meet regularly, the socializing has stopped. "We are not moving around now. We sit at home talking about Ebola and how it spread," the 24-year-old tells AFP. "I have to stay at home so that I don't contract the disease." El Hadji Abubakar, the township's Islamic leader, says people only venture out to worship, because they are "filled with fear and panic that this sickness will come". The 62-year-old imam, echoing every resident interviewed by AFP, says the community is well educated about Ebola and how the dangers can be minimized. Once a small fishing settlement, Kroo Bay is now a sprawling slum filled with rubbish in the capital, Freetown. Home to more than 6,000 people, it is overrun with shanty structures made from discarded metal, sticks, rubbish and mud. Pigs nose in the sludge, while the water is used as an open sewer. Below sea level, the slum sits at the point where two of the city’s main rivers reach the Atlantic Ocean. During the heavy rains of June to August, the water – which has a bluish tinge from all the effluent – regularly rises up and floods homes. A Save the Children survey found all the children had respiratory problems such as coughs and colds, while there were also incidences of malaria, leprosy, chicken pox and grave diarrheal illnesses. There is a health clinic but few people use it because you have to pay; instead people go to traditional healers. “We have so many problems – shanty houses and the flooding are the most pressing,” says Mohamed Kargbo, 54, secretary of the Kroo Bay Development Committee. Many families have to pay rent, even for shanty houses that have been built on the land illegally. As a result others are now trying to build their own houses further out, balancing them on rubbish on top of the sea bed. Freetown’s population swelled during the civil war as people attempted to escape atrocities, in which rebels mutilated their victims by amputating arms and legs with machetes. More than 60 percent have stayed in the capital, and still the rural-urban migration continues. Abdul Sankoh, 38, lives in Kroo Bay with his wife and eight children. To scrape a living he sells bags of coal when he can and makes 80 US cents per bag. He might sell 100 bags in three weeks. “I live here because I have no money,” he says about his pan body house, made from metal wrapped around sticks dug into the ground. Safiata Jalloh, 24, lives in the slum with her husband and two children. She is collecting buckets of dirt from the seabed to make the floor of her shanty house, for which she has to pay rent of 20,000 Leones ($8) a month. She will try to collect five buckets a day. During the heavy rains, her family fills 10 bags with sand and dirt to try to protect themselves against the floods.